Phase two of the Government's Help to Buy scheme was officially launched in October 2013 and ceased at the end of 2016. No new Help to Buy Guarantee mortgages can be taken out. 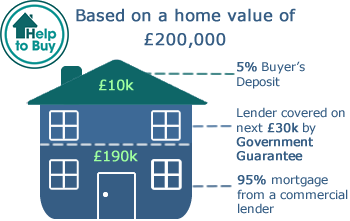 This part of the scheme aimed to help borrowers with at least a 5% deposit secure a 95% loan-to-value (LTV) mortgage from participating lenders on a new-build or existing home up to a value of £600,000. Under the scheme, the Government offered mortgage lenders the option to purchase a guarantee of up to 15% on mortgages. Because of this support, participating lenders were able to offer more mortgages to borrowers with small deposits. Participating lenders paid the Government a fee in return for them guaranteeing a percentage of the mortgage. This meant lenders were more comfortably able to offer borrowers mortgages of up to 95% LTV. How did it differ from phase one? This scheme was very different to the first phase of Help to Buy, which sees the Government provide borrowers with an equity loan of up to 20% of the property's value. Under the second phase, the Government simply acted as guarantor on eligible mortgage products, and wasn't directly involved in providing finance.